Damn, some of these speeds are ridiculous. I thought mine was fast. I pay $149.00 a month but have no cap. Dreading moving back to the states after I retire. stupid download caps and insane prices for so little. If you were a Twitch streamer, you would need considerably faster connections, so yeah... there are uses for such things. Personally I just like having crazy fast speeds. Time is money as they say. What I meant though is how much better is that internet really? Is it really worth it? Does it really make that much of a difference in terms of usability? Is there something you can do that I can't (something that matters anyway some theoretical anecdote 1%'er situation doesn't really matter) and I am complete debilitated if I tried to do the same thing. Really how often to you download a game and need to play it right there and then and can't wait or schedule the download overnight. Considering it would cost like $200 a month here for a plan like that is it really worth it? I think I have a pretty advanced/unique setup running servers and all and like I said don't really see how much better it could be, wouldn't be worth a 200% cost increase that's for sure. What does one need to do to be amazed like that with faster internet. Don't get that first part. As for the VPN's, in order of speed. IP Vanish, Vypr & Mullvad. IP Vanish was the fastest but they got busted for logging so I wont be renewing with them. Vypr gets pretty close to my max depending on the server, really 25/10 is really 23/9 and Vypr gets me around that. Well i write gaming reviews so being able to download em and play em right away is nice, especially when the key gets sent a couple hours before a game release instead of a couple days. I came from 12/1 to now 950/300. . When there's 3 PCs in the house and one mac that iclouds pretty much constantly, it went from not being able to game online at all because of rubber banding, to having MUCH lower ping, went from 60-80ms to 9ms, not only that, skype quality also became much better. 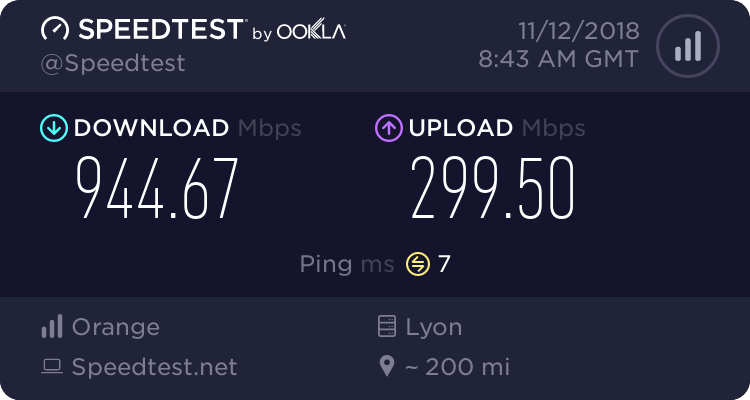 For us here in France the price was IDENTICAL between adsl and fiber so upgrade worth the price, we paid for 300/200 then a year later our ISP changed its plans and speeds so we ended up getting the speed i posted above. I recently got fiber (890Mbps/370Mbps average on speedtest for 1Gb/400Mb theoretical speed), coming from 6Mbps... Now even the 100Mbps at work feel slow. But because I'm not in the U.S., it all came with marginal cost increase. Same here, went from bouygues ADSL to Orange fibre and i could never go back. Yea that's crazy, our price is around 68€ so probably something like 77$ in todays exchange rate, with that you get a max of 1gbps/300mbps, depending on the time of day i can get anywhere between 700-950 down and the 300 is always constant. Also get TV with a few UHD channels, landline with free calls to france, canada/us and so on. On top of that i get a mobile 4g plan with 30gb of data. In the US i was paying 180$ for 100/10 and vastly unreliable and that's without the mobile, that was another 70+ or wtv verizon charged at the time. It's still shocking to me how much the US charges especially for higher speeds and no cap, theres countries in Europe that are even cheaper then that, people in Romania pay around 24$ a month for ISP service, assuming that includes tv and landline as well. Fiber is much nicer than simply the speeds alone. The bandwidth at the nodes is so much larger (and the signal so uniform) that latency is always very low and very stable. I wouldn't go back to coax or DSL with similar speeds for half the price. Recently was upgraded from Charter to AT&T Gigabit. Went from 300/10 to 1000/1000. Only paying $90 a month too. Down from $120. I had charter in MA, was absolute trash. Glad to see prices are coming down though, 90$ a month isn't bad for 1/1. Charter was awful at first. They fixed it and ran well for me. Depends on your location and how many people are on the node. Fiber is way better than coax for sure though. Last edited by Woundman; 12-17-2018 at 03:44 AM. Our upgrade was a bit larger, from 3 to 7, but I don't think we've ever seen more than 6.9mbps. In a town of 300 I think we're out of luck. Pretty glad with my 1000/750 line with Bell at CAD39 (USD29) per month. It's nice that it's FTTH and the backbone is also fibre, and not cable.